I enlisted in the Navy the day after Christmas, 1957. The recruiter said “Don’t leave town son, until we find you a boot camp". You belong to Uncle Sam now. Departed for recruit training in January 1958 my first train ride ever out of Detroit, Michigan. Having joined the Navy of my own free will and accord, I have advice for anyone thinking about joining any service that has recruit training at a northern base. Try to avoid recruit training in the middle of winter! Training went from mid-January to mid-April about an hour north of Chicago alongside Lake Michigan. In addition to the usual manual of arms, hand washing clothes, very early wake ups, marching to mess hall, marching to classes, marching to the drill field, from the very first snow flake to the end of any snow fall, the brooms and shovels were manned around the barracks area to clear the slightest snow flake. My company commander was from the Detroit area, but had no sympathy for a fellow Michigander. Great Lakes dates back to WWI and some of the original buildings are still standing. All Navy, men and women, boot camps are held at Great Lakes now, with many service schools and support personnel based there, such as electricians, gunners, corpsman schools; recently the entire recruit training area has been updated from the WWII style barracks. Besides learning how to be a sailor and learning about living with others from across the US and its territories and Navy traditions, I recall only one bad experience. Our barracks had the old steam heat and radiators with dozens of sailors in our bay. One was accustomed to the musty smell when coming in from the brutal winter weather but it was getting smellier. Well, we had a bed wetter in there somewhere, with a cotton mattress that went undetected for weeks. He never made it to graduation, I can tell you that. Aweigh” was played for the first time with real meaning at our graduation. Every veteran remembers the first time you heard your service song at graduation, you know the feeling when I hear that song, after so many years ago. As a brand new Seaman Apprentice (E-2), I was ordered to my first duty station at Bainbridge, Maryland, about an hour drive north of Baltimore. The base dates back to the Korean War days when men and women’s (Waves) boot camps were based there. There was a Naval Academy Preparatory school, several basic service schools, such as radioman, fire control technician, personnel and perhaps a few I have forgotten. Oh yes, a Corpsman school, that is where VVA Chapter 310 members David “Doc” Martinez and his wife Sandy met. 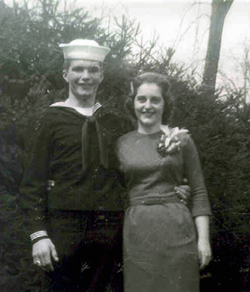 Doc was going to school to be a corpsman and Sandy had just completed her Corpsman school. They met and you know the rest of the story. Mr. & Mrs. D. Martinez are approaching their 55th Wedding Anniversary. My assignment was in the 1st Lieutenants division, cutting grass, picking up cigarette butts and the like. 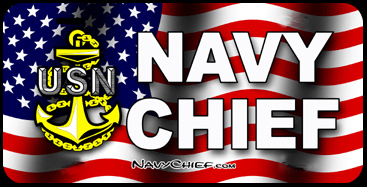 One day the Chief Petty Officer in charge asked who could type. Having that in high school, my right hand went up for the second time in my naval career. First time being sworn into the Navy back in January!!! The Chief, thank you very much, sent me to the supply department. Job was running three of the old mimeograph machines; full bore just about all day long. These were the machines that you poured ink into and used the blue stencil to make test booklets, informational sheets of paper etc. My immediate supervisor must have seen something of value in me as he asked just what I was going to be in the Navy. I shrugged my shoulders as I then found out that I was supposed to get a basic school after recruit training, as a high school graduate, but that fell through the cracks. How was I to know at 18? The supervisors said go check out a supply course and study it. I took my very first, of many to come, test for promotion while at Bainbridge. Many fond memories of Bainbridge, being out of boot camp and on my own for the first time can be scary for a young man at first. You meet people real fast and you all have something in common, working for the same company (your country). The base movie was at an astronomical 10 cents and haircuts for a quarter. Journeyed to Lancaster, Pennsylvania, quite a bit to see for the first time Amish country and its people. Bainbridge led me astray for the first time in my Navy career. A buddy from Boston talked me into hitchhiking (remember your hitchhiking days) to Dayton, Ohio to visit his gal. Well, we were about 6 hours late returning to base, that is called AWOL (absent without leave) no matter how you address it. You should have heard the story that he and I concocted to tell the Commanding Officer at Captains Mast. Needless to say the skipper saw right thru it. I can’t recall the punishment. The only thing he probably took into consideration is that we both worked on the same floor as his office and perhaps it was just a slap on the wrist, I can’t remember. Having taken my first test at Bainbridge, the results came through after reporting aboard ship and I was promoted to Storekeeper Third Class (E-4). Serving aboard ship is where the men are separated from the boys. My scrape with commanding officers was minor co mpared to the Summary Court Martial and another couple of Captains Masts before I married my wife Lois in 1960. I sure picked up and dropped an attitude real fast. Spent 4 ½ years aboard the Salamonie. I was trying to understand the Navy and the Navy was trying to understand me! I had a reduction in grade that I had just been promoted to, in addition to the other couple of Captains Masts; managed to leave the Salamonie with not only my original promotion back, made it to Storekeeper Second Class (E-5). Now you know the secret; my marriage to Lois! “AO”on a ship designation stands for “Auxiliary Oiler’’. The Salamonie served from 1941 to1968 and at one time was the Navy’s most continuous active duty ship. Commonly called a “tanker”, she refueled other ships at sea including aircraft carriers, destroyers, cruisers, battleships and the like. Literally a floating gas station, carrying black oil, aviation gasoline, jet fuel and bottled gasses, such as freon, acetylene, carbon dioxide as well as 55 gallon drums of lubricating oils. My duties included assisting the Paymaster with paydays, ships store (PX) records, commissary records (fed the crew on $1.42 a day per man) and control of all ships spare parts of electronics, machinery, and gunnery. Everyone has a duty station during refueling; mine was the area of breaking out the bottled gasses and drummed lube oils (by hand) and preparing them for transfer to other ships. When not transferring cargo, kept manual readings on the black oil tanks. The oil is heated and then transferred and was measured in depth; you transferred 30 feet of oil, the office broke that into gallons and invoiced the ship being refueled, then a radio message went out to the fleet commander to confirm the readiness of all his ships while deployed. I suppose these days the computer does it all. On a dependent’s cruise the ship takes the families out for a short “spin” on the ocean and does a token refueling of a ship simulating pumping of fuel and rigging for cargo and human transferring, etc. Having observed hundreds of refuelings by then, I told my wife “let’s go up to the 04 level (life rafts) and get a better view”. I could see that the destroyer was getting closer to our ship, that’s why, without scaring Lois, we went to the 04 Level. Indeed the two ships collided. No major damage thank goodness, lots of kids and dependents scrambling off their folding chairs on the destroyer and an emergency breakaway on our part. I can imagine the report that went to the Admiral!!!! There were lots of close calls in other refuelings aboard the ship both during day as well as night refueling. Salamonie’s motto was Anywhere, Any weather, Any time. I recall, in addition to coastal operations in the U.S., three six month Mediterranean cruises, one North Atlantic cruise and two cruises to Guantanamo Bay, Cuba with an emergency trip to the Ivory Coast and Ghana in Africa. “Join the Navy and See the World,” I was told. I would like to share with you the ports of call that I experienced while aboard the USS Salamonie (AO26 ).